With our DDoSMon, we are able to perform continuous and near real-time monitoring on global DDoS attacks. For quite a long time, DNS, NTP, CharGen and SSDP have been the most frequently abused services in DDoS reflection amplification attacks. They rank respectively 1st, 2nd, 3rd and 4th in the last 365 days. Over the last 365 days, we have observed a total of 304,146 CLDAP reflection amplification attacks involving 215,229 unique IPs. 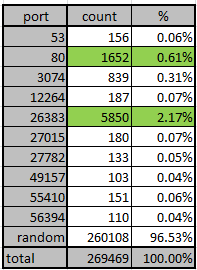 In the last three months, CLDAP attack has entered into a new stage, the number of CLDAP attacks in the last three months has reached to 168k (11.2%), slightly more than CharGen attack(164k, 11%), and much more than SSDP attack (70k, 4.4%). Our DRDoS data feed at our OpenData page maintain a list of top reflector IPs being used in the last 30 days, security researchers can contact netlab@360.cn to apply for free feed download. The above figure shows last years’ weekly counts of CLDAP reflection attack. From the above statistics, you can see that CLDAP has become one of the workhorses in DDoS attack. We also extracted all the LDAP reflector IPs that had been used in ddos attacks, did a month to month comparison, and generated the following diagram. From the diagram, you can tell that the overlap rate of CLDAP ips has been going up and getting stable at around 40%. In all attacks involving CLDAP, over 84% are CLDAP only, with no other combined attacking vector. There are also some other combinations, which be seen as below. The duration of CLDAP attack varies: the shortest attack was less than 1 minute, and the longest one lasted more than 3 days. 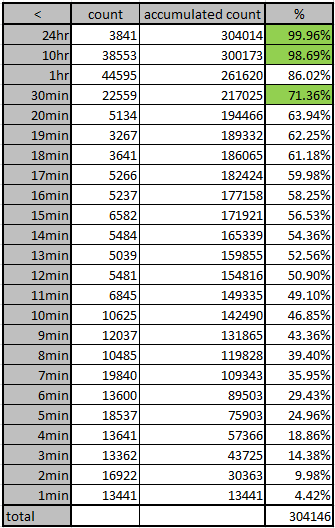 As shown in the figure below, the attack time span at 1, 2 and 3 standard deviations (68%, 95%, 99.7%) are respectively 30 minutes, 10 hours and 24 hours. The 3-days attack mentioned above occurred from 2017-09-24 15:00:00 to 2017-09-28 09:00:00. The victim IP address, 151.***. ***.15 belongs to a CDN service provider. 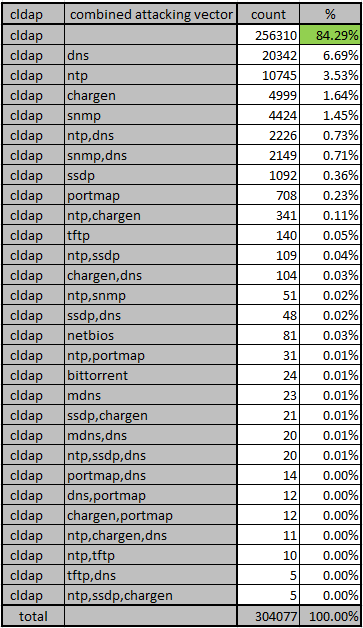 In most cases(96.5%) of CLDAP attack, the destination ports are randomized. This is consistent with other reflection amplified DDoS attacks. Note port 26383 stands out, which is not a commonly used service port, we suspect a particular CLDAP attack toolkit gets reused all the time by different attackers, or maybe there is big CLDAP attack provider somewhere.